Cycology Travel marks International Women’s Day, March 2018, by hosting a Women’s Ride in Mallorca, Spain. Cycology Travel Ltd,the luxury specialist cycling vacation provider, has designed the International Women’s Day Collection (9th March -12th March 2018) as an amazing ride experience for a small group of women who want to enjoy the challenges and camaraderie of a group ride along the formidable Serra de Tramuntana mountain roads and to really test themselves with some tough climbs and distance cycling. Robert Bell, founder of Cycology Travel says: “This is a great way for a woman to share her passion for cycling, to make friends, share advice and benefit from the support of the other female riders in the group. We are offering female cyclists (maximum number of twelve) an unforgettable experience, a personal challenge in beautiful surroundings, and it’s a great kick-start to the cycling season”. The only requirements are that participants can complete a daily ride of 50 miles comfortably and be at ease riding in a group of cyclists on a road, in traffic. Riders can hire Trek Silque S6 and Trek Silque SL WSM bikes in Mallorca, or bring their own (with a reduction in the package if this is done). For three nights, four days, half board in Hotel Esplendido’s four-star luxury accommodation, March 9th to 12th 2018, prices for riders start from £1,800 per person, in a double occupancy room or £2,100 single occupancy room. Cycology Travel Ltd is a luxury cycling tour operator, delivering world-class, bespoke, luxury cycling holidays and memories for both devotees and recreational cyclists. 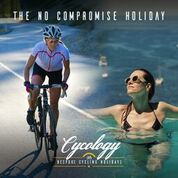 Cycology Travel is the only cycling brand that offers a world-class, unforgettable holiday experience for cyclists and your significant others (YSOs). March 10th 2018 Day Two: Coastal Loop 75km, including the hamlet of Deia and town of Valldemossa. Climb up past George Sands and via Esporles for a snack & coffee stop. From there head back via Palmanyola, Bunyola & over the scenic Coll de Soller and finally head back to the hotel. Post ride there will be a presentation and interactive workshop on the benefits to the cyclist of core stability, stretching and injury prevention from a professional cycling team physiotherapist. March 11th 2018 Day Three: Climb up Coll de Soller as the warm up and then cruise inland towards Bunyola & Santa Maria del Cami and stop at Alaro for refuel, recovery and regroup. Then the group heads back towards Bunyola, Coll de Soller and back to Puerto Soller. March 12th 2018 Day Four: Possibly the hardest and definitely the hilliest day, taking on the highest climb on the island - Puig Major – just shy of 900m over a 14km ascent, with a grand total for the day of just under 2000m of vertical climbing with the descent over the majestic serpent winding road of Sa Calobra. After a refreshment break at the base of Sa Calobra the ride retraces its path up Sa Calobra, with two points on the road at 11.5% ascent and makes its way back up to Cuber, through tunnel Puig Major, and down the long winding road back to Puerto Soller. This press release was distributed by ResponseSource Press Release Wire on behalf of Cycology in the following categories: Leisure & Hobbies, Women's Interest & Beauty, Travel, for more information visit https://pressreleasewire.responsesource.com/about.